Charles II has been restored to the throne after nine years of exile. The bloody English Civil War has ended and English citizens are breathing a sigh of relief. After over a decade of political turmoil, the liveliness and grandeur of court life has returned. Yet with Charles II's return will come many changes, including ones that affect some of his far-off citizens: the American colonists. 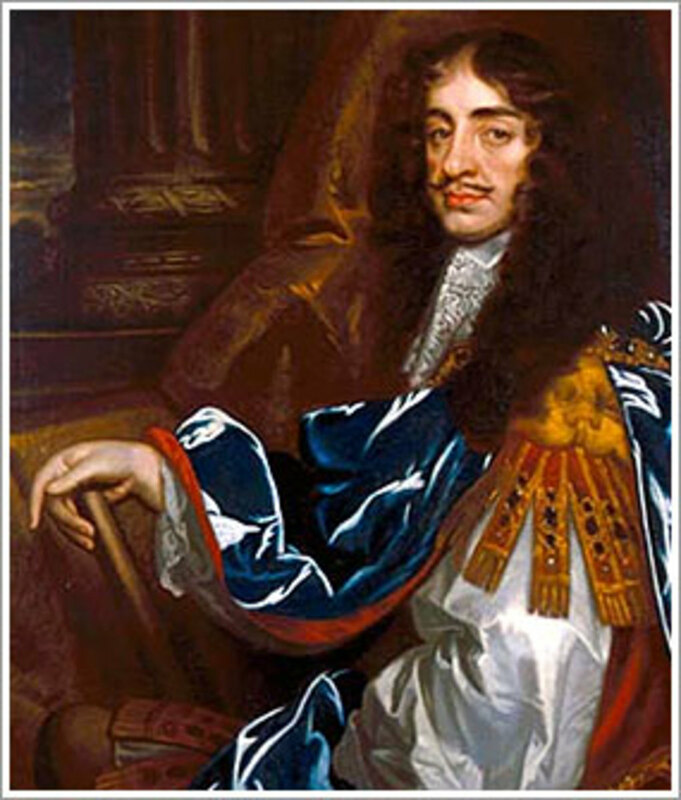 During a period known as the Restoration, Charles II would reissue several laws that had been passed by his father before the English Civil War. One of these laws was the Navigation Act of 1651, which Charles made void and reissued as the Navigation Acts. This signaled a significant change in English policy towards the colonies. Previously, the monarchy and Parliament had paid little attention to the colonists. Yet Charles believed that change was needed: the colonists should be brought more tightly under control of mother England. There were several factors that led to Charles's decision. First, the rise of mercantilism led many European nations into fierce competition for natural resources from their dependent colonies. However, mercantilism didn't allow free trade; it merely maintained the status quo of all involved, rather than increasing the living standards or stimulating economies. Second, Charles II needed cash. The Civil War had cost him dearly, and the restoration of court life and his power would be costly. Third, the English had long been competing for colonial markets with the Dutch and wanted to kick them out of America for good. Finally, the landed gentry wanted a stronger English navy to protect their interests at home and abroad (as many gentry invested in foreign trade), leading to extensive shipbuilding. So, in 1660, Charles II looked to the past in order to ensure his future. British Parliament has just passed the Navigation Act of 1660. Essentially, only England could trade with the American colonies. Ships trading in the colonies had to be constructed in either England or one of its possessions and had to have a crew that was at least 75% English. Additionally, certain goods of great value ("enumerated goods"), that were not produced in England could be transported only to England or another English colonial port. These goods included tobacco, sugar, cotton, indigo, dyewoods, and ginger. 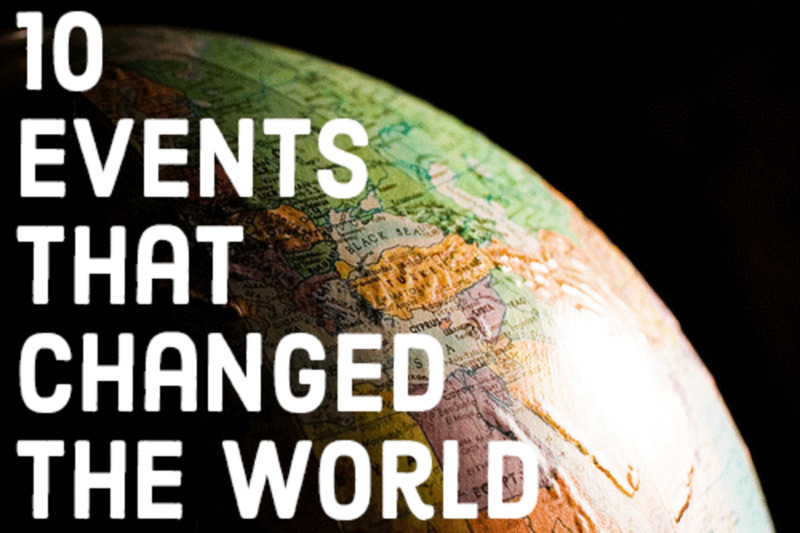 In later acts, rice, molasses, rosins, tars, and turpentines were also added to the list. This meant that all goods produced in the colonies had to go straight to England or another English port. 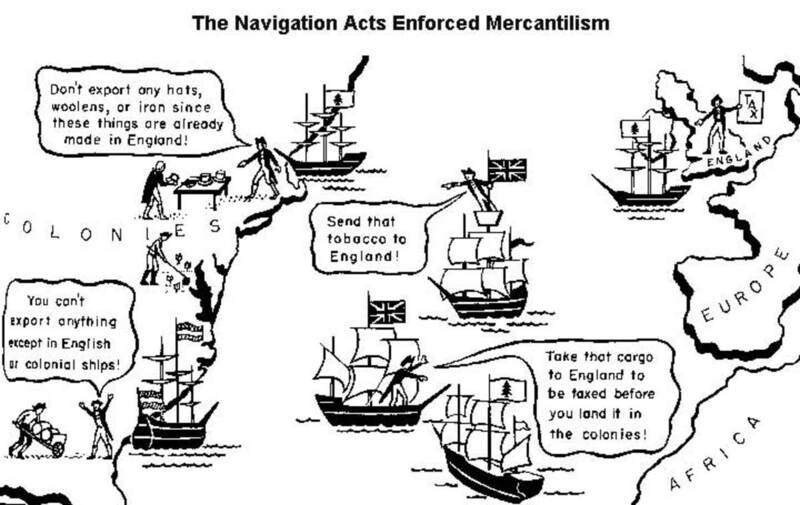 The First Navigation Act forced other European nations to buy goods in England - they couldn't go to the American colonies seeking goods or raw materials. For the colonists, this stripped away any notion of free trade and restricted their markets severely. The first Navigation Act was quickly followed by a second in July of 1663, known as the Staple Act. 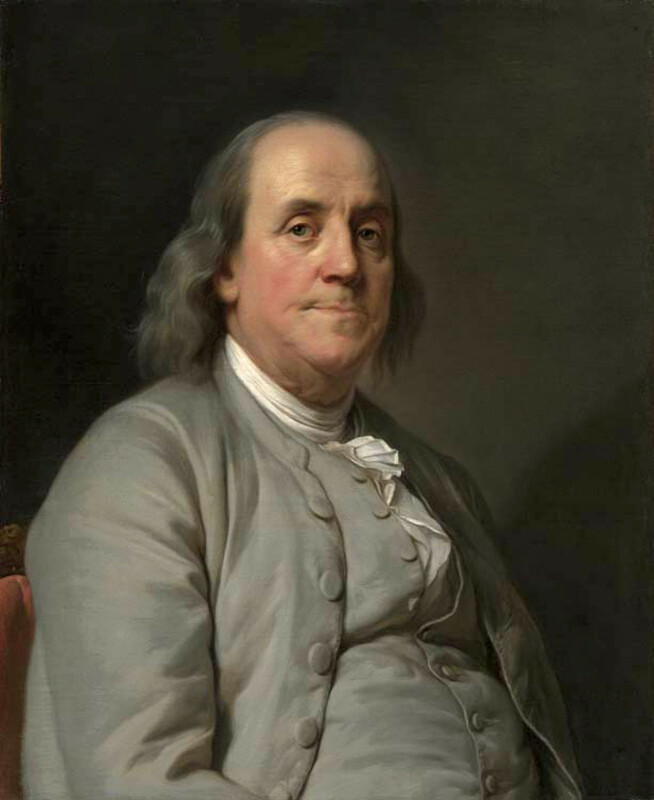 This Act decreed that nothing could be imported into the American colonies unless it had first been shipped through England. In England, the goods would be unloaded, inspected, paid duties, and reloaded onto the ships. As a result, the prices of goods and the time it took to ship goods drastically increased. Goods being taken to the American colonies from foreign ports had to first pass through England. 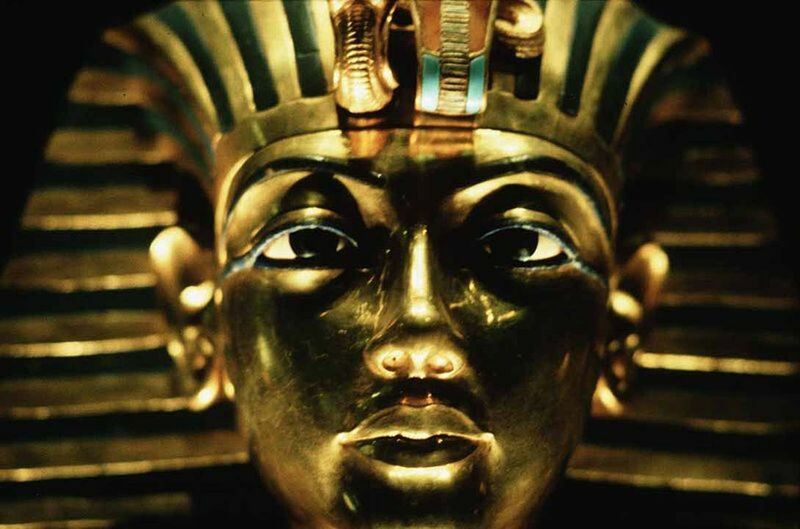 This meant that to obtain African slaves or the latest Parisian fashions, you had to pay the costs associated with taking those goods from their original market (let's say Africa) to England and then from England to America. American colonists were, essentially, paying double the price for the same product. At this point, things started to heat up. The colonists were growing angry - protests occurred in Virginia against the Acts. Much of the anger was directed towards customs agents. Other colonists - like those in New England - chose to ignore or skate around the Acts. Many merchants would pick up their cargos in America, sail to another English colonial port (such as Jamaica), and then sail to foreign markets (Holland or France) to sell the goods. Yet mother England wasn't done with the new rules. The Navigation Act of 1673, also known as the Plantation Duty Act, required colonial ship captains to guarantee that they would deliver enumerated goods to England or suffer financial penalties. To do so, all goods not bonded in England had a duty and bond placed on them when the ship reached the colonies. The governor - or his customs agent - collected this bond and duty on behalf of England. Reducing trade between the colonies and foreign nations, thereby hurting foreign powers' profits. 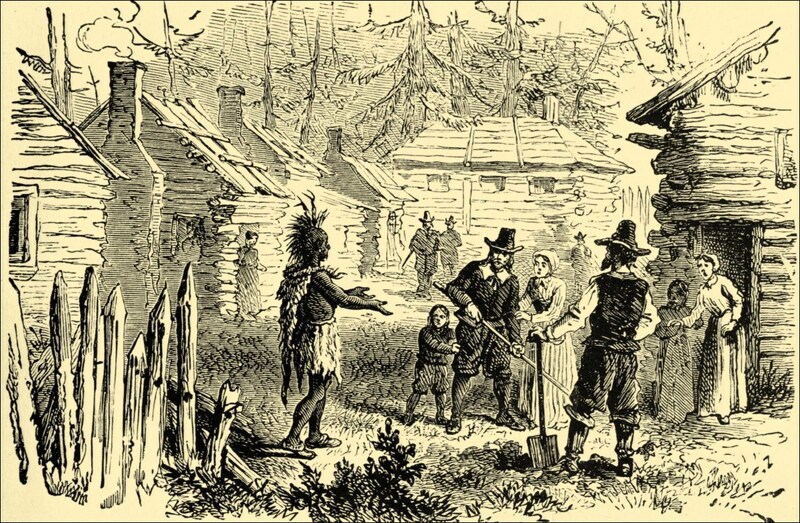 The Acts essentially created the illusion of an English "empire" in America. Unfortunately, the colonies weren't really united at this point. The colonies had all originated for different reasons, and these differences hadn't disappeared despite mother England's attempts to ignore them. The Acts were also drastically restricting colonists' purchasing power. Many could no longer afford goods regulated by the acts due to the markup imposed by merchants looking to recoup duty and tax costs. 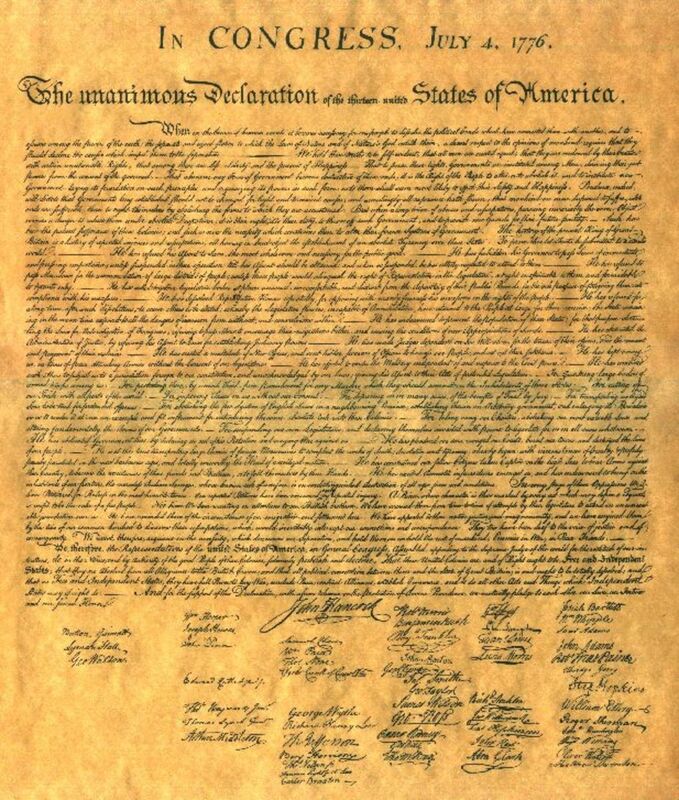 This severely angered the colonists and led or contributed to many rebellions in the colonies. 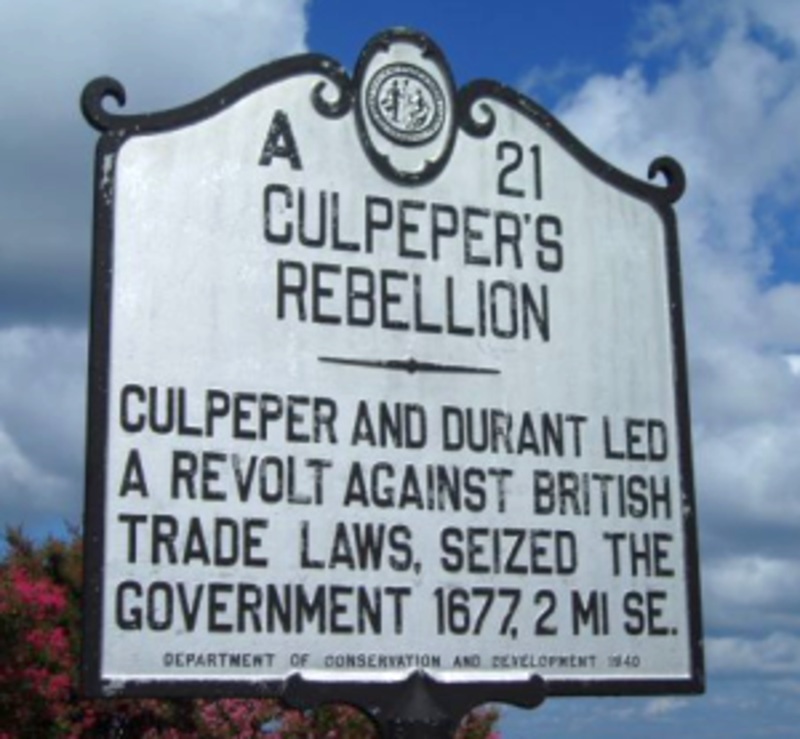 Culpeper's Rebellion in North Carolina was one of the rebellions directly attributed to the Navigation Acts. The North Carolina government consisted of the Governor, Council, and an Assembly. However, the colony was primarily ruled by eight Lord Proprietors, who had a direct hand in electing the Council and lived primarily in England. The Proprietors ignored warnings by Governor Peter Carteret not to enforce the Navigation Acts, and tensions ran high throughout the colony. Two factions were divided over the issue. 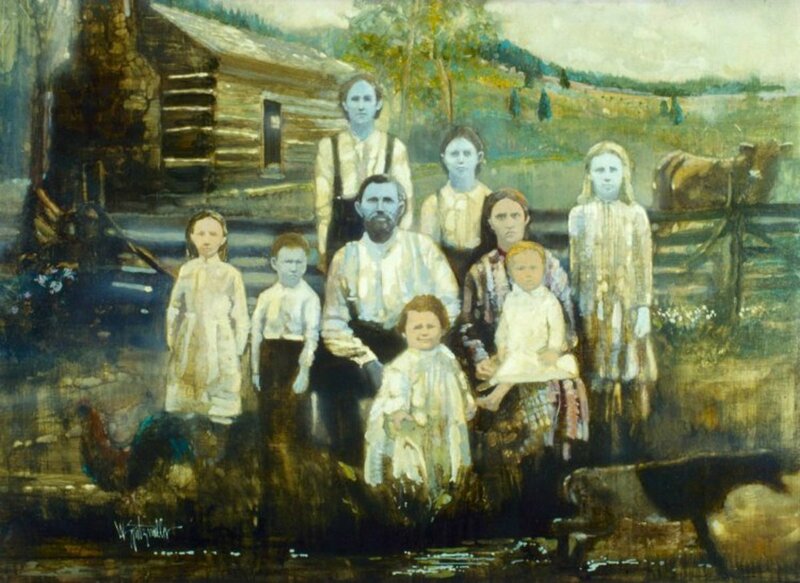 Supporters of the Navigation Acts rallied behind Thomas Miller and the Proprietors. 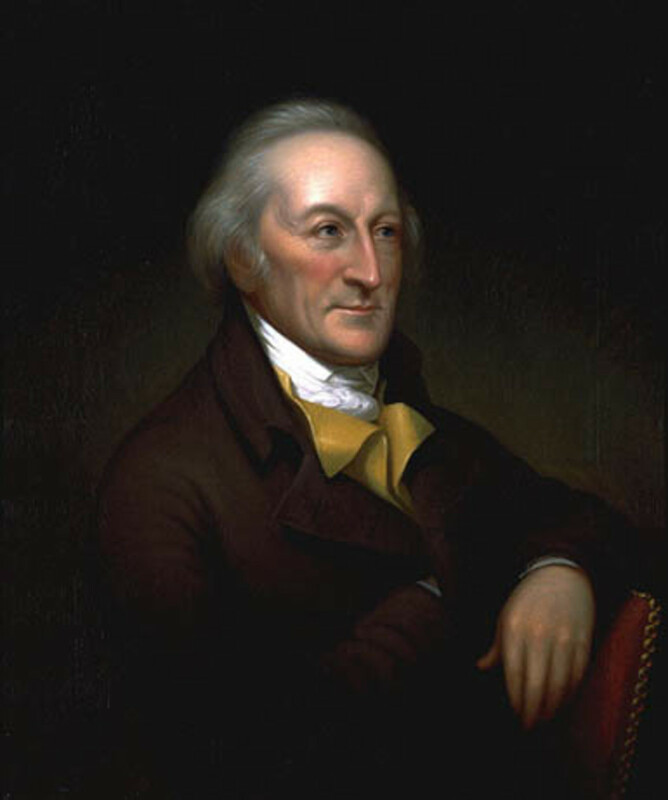 Miller was soon named secretary and collector of the duties and then became acting governor of the colony. He vastly abused his power as governor, tampering with local elections and imposing heavy fines on North Carolinians. The opposition, led by John Culpeper, John Jenkins, and George Durant, had had enough. Backed by armed supporters, the opposition leaders captured and imprisoned Miller, arrested other officials, and overtook the North Carolina government. However, the Proprietors summoned John Culpeper to England, where he was promptly arrested on charges of treason. 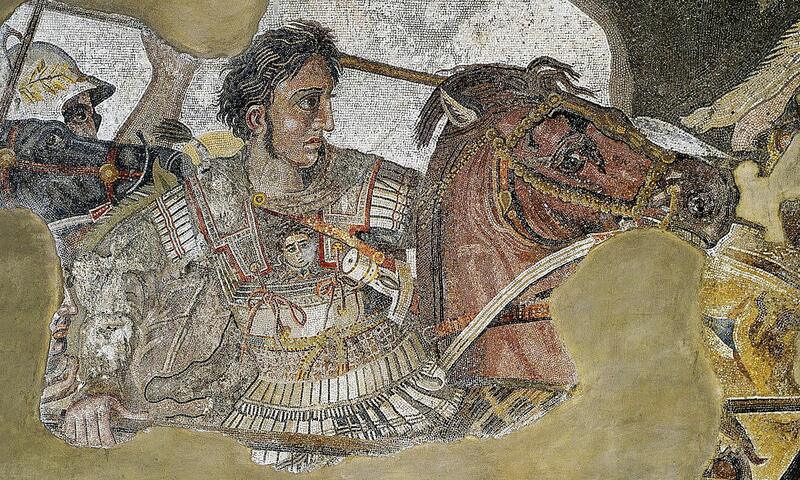 He was put on trial, but not found guilty, which ended the rebellion. Despite such reactions, the first three Navigation Acts were only the precursors to what would happen in the 18th century. Since the American coast was full of out-of-the-way harbors, the Navigation Acts were largely difficult to enforce. Yet that would change in the coming decades, as subsequent Navigation Acts - eventually backed by British soldiers - would push the colonists to boiling point. How well do you know the Navigation Acts?